Figure 3. 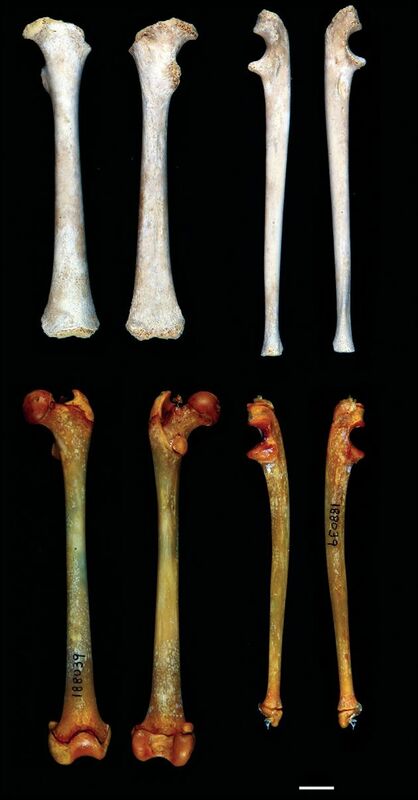 Comparison of the femur (a, anterior view; b, posterior view) and ulna (c, lateral; d, medial) of Antillothrix bernensis (top) and a male Cebus apella with unfused epiphyses (bottom). Scale bar, 1 cm. See electronic supplementary material, figures S5 and S6. From: Rosenberger et al (2010) First skull of Antillothrix bernensis, an extinct relict monkey from the Dominican Republic. Proc. R. Soc. B.